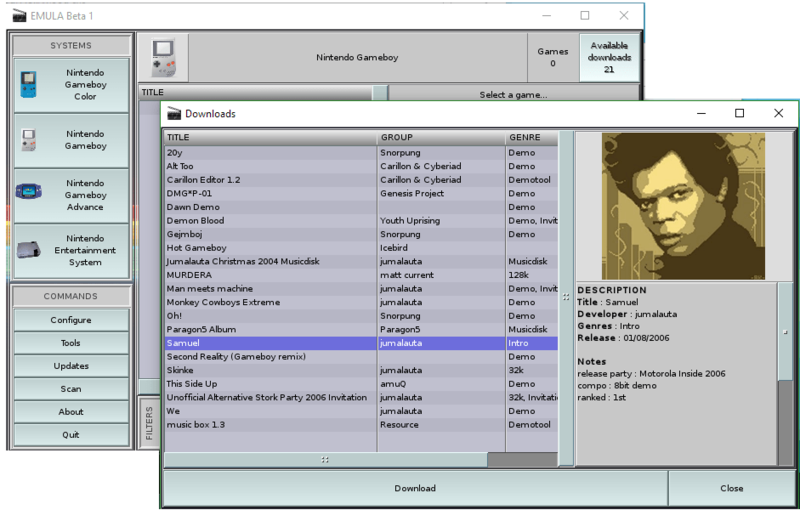 Now the big next step is to fill up the downloads database with stuff so that all EmuLa users will be able to downloads free contents for every emulated platform! If the following screen shot you can see on the top right a new button that shows how many free downloads are available for the currently selected platform, the count take into account stuff that you already own or that you have downloaded previously to keep things easy and to let you know exactly which content you have not yet downloaded. Clicking this button pop up the download window and selecting a download will shows a screen shot and some basic informations about the selected content. Since the content is not yet downloaded the screen shot is retrieved from internet but as soon as it will be downloaded both the rom and the graphics will become local. Soon I will look for betatesters, if you are interested stay tuned and follow the development on Twitter or Facebook! Next Post Next post: EmuLa development: what goin’ on?